My great-grandfather, John Robert Morrow, was born to Richard and Winifred Morrow on 29 February 1884 in the parish of St Peter’s, Manchester. In 1901 he was 17, the eldest of seven children, living with his parents at 10 Howard Street in St Philip’s parish and working as an iron moulder. He enlisted as a private in the Manchester Regiment at Ashton-under-Lyne in January 1904, serving for three years with the Colours before being transferred for nine years to the Army Reserve. We have no record of where he spent his active service, but when his three years were up he seems to have returned to civilian life in Manchester, where he married his wife Mary Ann in 1909 and where their son, Richard, was born the following year. By 1911 the 27-year-old John was once again working as an iron moulder and the family were living at 21 Tonge St, Ancoats. We don’t know exactly when John rejoined the Manchester Regiment at the outbreak of war in 1914, but he must have done so in time to reach the 2nd Battalion, stationed at the Curragh Camp, County Kildare, Ireland, before it embarked for France on 4 August as part of the British Expeditionary Force. The battalion landed at Le Havre on 17 August and went by train to Le Cateau, a few miles south of the Belgian border. It then marched to Hainin, a small village near the town of Mons in southern Belgium, where it arrived on 22 August. The division received orders to hold the line of the Mons-Condé Canal, which ran due west from Mons, and the battalion dug in. The story goes that when the assault came the next day, the rifle fire of the British troops was so rapid that the Germans thought they were facing machine guns. Even so, the British troops on the other side of Mons were forced to abandon their positions as the afternoon wore on. The Manchesters held up the attack and allowed other units to withdraw before eventually retreating themselves. They reached the village of Dour on 24 August and were once again thrown into the front line, holding off the enemy with rifle and artillery fire before receiving orders to fall back once again. It was at Dour that John Morrow was shot in the leg and taken prisoner on 24 August. 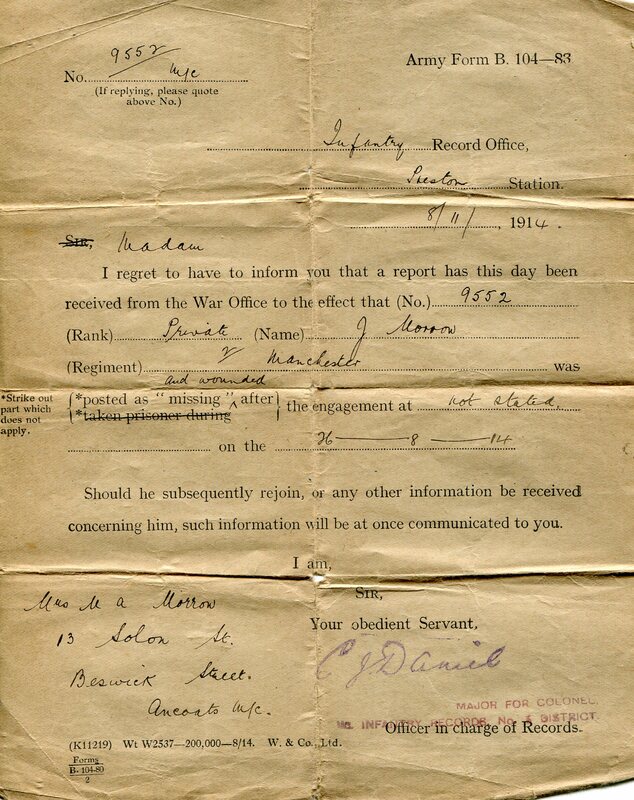 His wife Mary Ann received no information about what had happened until she was sent a form dated 8 November 1914 by Preston Infantry Record Office, stating that he had been reported missing and wounded on 26 August. This terse, vague note, which arrived weeks after the event, must have come as a great shock to Mary Ann. She carefully preserved the form, which was handed down through the family and survives to this day (reproduced below). Fortunately, John recovered from his wound. He spent the rest of the war in internment camps in Germany, including Münster and Soltau, where Red Cross inspectors described the conditions as good, despite complaints by prisoners that they did not receive enough food. In any case, John survived his imprisonment and returned to Britain aboard SS Stockport, arriving at Hull on 18 November 1918. 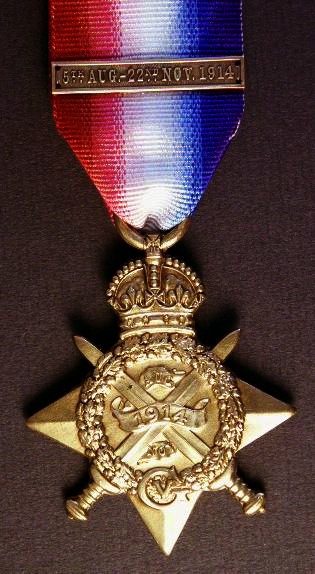 He was issued the 1914 Star and Clasp, the British War Medal and the Victory Medal. This was not the last time John was decorated, however. By 1938 he was living in Merewood Avenue, Wythenshawe, and on Sunday 14 August he went with Mary Ann and Richard on an outing to the seaside resort of New Brighton, in the Wirral. As they stood on the promenade watching the sea, which was heavy because of an incoming high tide, they noticed two boys swimming, apparently unaware of the risk they were taking in such adverse conditions. One of the boys, 12-year old Leslie Chester, from Wallasey, was carried out of his depth by the strong currents and was unable to swim back to shore. John immediately dived into the sea fully clothed, at the same time preventing Richard from doing likewise, and reached the drowning boy, who tried to grab him round the neck. John broke the boy’s hold and eventually brought him, choking and unconscious, to dry land. Leslie recovered after receiving artificial respiration and, in the words of an account which appeared in the Wythenshawe News a few days later, “a tragic calamity was averted”. John was taken to the police station and wrapped in blankets while his clothes were dried. The New Brighton Police Department endorsed his bravery and notified the Liverpool Shipwreck and Humane Society, which awarded him its Silver Medal in recognition of the gallant rescue. John Morrow died in Manchester in early 1948. From 2004 to 2012 I worked as a translator in Brussels for an agency which coordinates air traffic control in Europe. Mons is an easy train ride from Brussels and I visited it several times without realising that my great-grandfather had served nearby. I have no idea what John Morrow would make of today’s European project and institutions, though I hope he would be pleased to see people from all over the continent working together for a more peaceful and prosperous future rather than trying to blow each other to pieces. At any rate, I am proud of how this brave, tough and honourable man fought and what he fought for. Without him and those like him, the map of Europe and the course of history would have been very different, and we might not be able to take for granted the human rights and fundamental freedoms which my current employer, the United Nations, is responsible for upholding. Many thanks to Catherine Hennessy for finding John Morrow’s medal card and short service attestation and for providing so much information and encouragement in uncovering his story. Among the sources used were the 1901 England, Wales and Scotland Census, the 1911 Census of England and Wales, the Register of Births and Baptisms, the Register of Marriages and Divorces and the Register of Deaths and Burials, all searched through the Find My Past website; the website of the Manchester Regiment; the archives of the International Committee of the Red Cross; Sir Arthur Conan Doyle, The Great War, vol. I: ‘The British Campaign in France and Flanders’; the blog Army Service Numbers 1881-1918; the Wikipedia pages on the 1914 Star, the British War Medal and the Victory Medal; and various military history web pages, including about.com. All websites were last checked on 25/08/2014. Thanks to you. 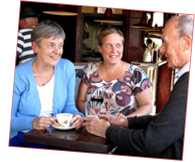 Your site on the 17th Manchesters is fantastic, a very fitting tribute to your grandfather. The insight into the an Old Contemptible in 2nd Bttn is very similar to my own with a distant cousin in the 1st Bttn. This is my only family member known to have died in the War and I still don’t know when / where he was captured. I have a recent translation of IRRC records to add to http://17thmanchesters.wordpress.com/2014/03/19/alfred-ridge-manchester-regiment-cousin-died-191718/ Any bright ideas would be appreciated. Hi Tim, this is Tom again. I can tell you that the translation of the ICRC records is correct – “Handgr.” is short for Handgranate and Gesaess (can’t find the umlauts on this keyboard) means seat/posterior, and Wevelgem is near Courtrai/Kortrijk in southern Belgium. I’ve found quite a lot of information about my great-grandfather and other members of my family on http://www.findmypast.com/ – there is also a newspaper search option on that site which might help you, though the British Newspaper Archive should certainly have the information once they finish digitising everything, as you say on the page you sent. I’ll think on and see if I can come up with anything else. Good luck! Thanks Tom, CWGC concentration records show Alfred was moved from Menen Wald, which is now a German cemetery, to Harlebeke. I want to the latter, but had used up all my brother’s patience for the visit to the place where our Grandad’s cousin was originally buried – Not everyone is a WW1 geek! Thanks for the translation. A hand-grenade wound to the bottom is a sad way for my Old Contemptible to go, especially after he must have survived so much before. I’m still stuck on the date and location of capture. Sorry about the long delay in replying Tim, and that you didn’t make it to the precise burial site. Still, Belgium’s close enough for another visit with a more long-suffering family member some time, I hope! For the precise date and location, we were just lucky to have that army form in the family, which is where the research started really (even though the information in it wasn’t all correct). But in all the confusion when your grandfather’s cousin was injured and captured, a lot of information may have been lost or never recorded. Let me know how your search goes, though! Hello Tim and a happy new year to you! Please see a new comment by Tom Caldin addressed to you.